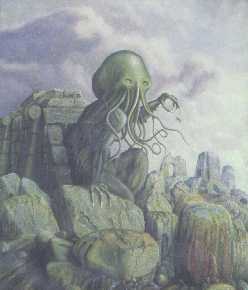 H. P. Lovecraft's mythos bears a distinct similarity to alternative history. We compare the texts to see just how close they come. Newly updated with the latest alternative archaeology. In a previous Lost Civilizations Uncovered article, "From Cthulhu to Cloning," we saw how authors of alternative history unconsciously appropriated the fictional mythos 1920s pulp fiction author H. P. Lovecraft created. Lovecraft's tales of alien dieties bestowing the dubious gifts of extrastellar civilization on a sleeping world went on to inspire the ancient astronaut frenzy of the 1970s and eventually the lost civilization excitement of today. Alternative authors seem to accept many of Lovecraft's ideas as fact, even though he himself admonished readers to remember they were merely fiction, their verisimilitude the result of his ideas being shared with his friends and fellow horror-authors: "This pooling of resources tends to build up quite a pseudo-convincing background of dark mythology, legendry, & bibliography--though of course none of us has the least wish to actually mislead readers." Nearly seventy years after his death, Lovecraft's brand of dark cosmic terror continues to deceive readers who unsuspectingly pick up non-fiction books without realizing the influence a fiction-writer's ideas have on today's pseudo-science. Of course, Lovecraft also had his antecedents, the pseudo-science of the 19th century, like Donnelly's Atlantis: The Antediluvian World or Churchwell's tales of the vanished continent of Mu. Lovecraft was the first to add aliens into the equation, and so he is the one we turn to in order to see a comparison between what is claimed as fact today and Lovecraft's fiction of long ago. For the comparison below, I drew upon the works of H. P. Lovecraft and the books of ancient aliens proponents Erich von Däniken and Robert Temple, and the alternative historian Graham Hancock. Däniken, Erich von. Chariots of the Gods? Bantam. New York: 1969. Hancock, Graham. Fingerprints of the Gods. Crown. New York: 1995. ---------- and Robert Bauval. Mystery of the Sphinx. Crown. New York: 1998. ----------. Heaven's Mirror. Crown. New York: 1998. ----------. Underworld. Michael Joseph. London: 2002. Lovecraft, Howard Phillips. The Best of H.P. Lovecraft: Bloodcurdling Tales of Horror and the Macabre. Del Rey Books. New York: 1982. ----------. The Dream Cycle of H.P. Lovecraft: Dreams of Terror and Death. Del Rey/Ballantine Books. New York: 1995. Temple, Robert. The Sirius Mystery. Destiny Books. Rochester, Vermont: 1998. © 2001-2002 Jason Colavito. All rights reserved.